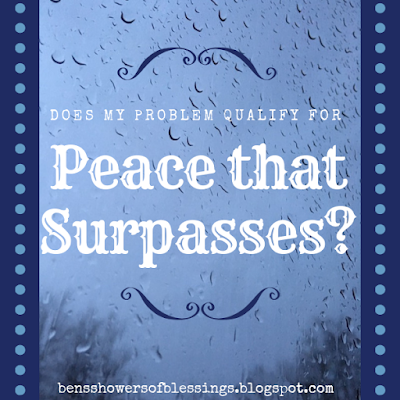 Showers of Blessings: Does My Problem Qualify for Peace that Surpasses? Today's post goes hand-in-hand with last weeks poem, therefore I am making it into a two part series! I will post both last week and this weeks posts in my "Blog Series" page! 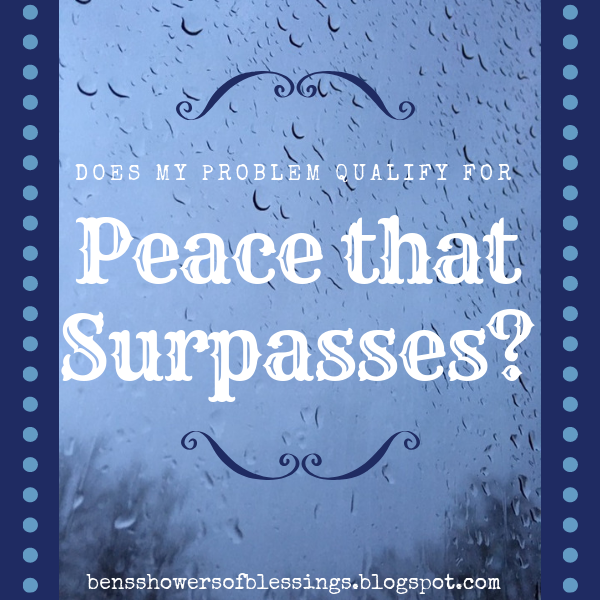 Does my problem qualify for peace that surpasses all understanding? There is no qualification process when it comes to God’s peace. God’s peace is given to comfort and calm His children, no matter how big or small their situation. All kinds of problems weigh us down and eventually we become so tired and so worked up that we don’t even know if “peace that surpasses all understanding” is even out there. We worry, we hyperventilate, we cry, we feel hopeless. These problems that we face can be set off by the tiniest of things but go way deeper. Things that are unsettled from months or even years past can resurface themselves with a vengeance no worldly peace can quench. Peace from the world is temporary, it lasts for a moment until we can cover up our true feelings, pushing them down, and locking them away. That is, only for them to come back up again in the future. Peace from God is felt deep down, a peace that starts from the inside first. It’s that still small voice when the world around you is in chaos. It’s that presence you feel when you are calm and still, despite the circumstances. God’s peace is felt the strongest in the times when all you want to do is sink down on the kitchen floor and bawl your eyes out. The moment that seems hopeless is the moment when God works in our weakness and shows us Hope. Some might feel a peace settle over them in a Divine Presence. I have read about how people will be in a stressful situation and then they will pray. Immediately they will feel a peace that surpasses all understanding. Umm, am I the only one who has not experienced this? I’m not saying this cannot happen, but I do believe that peace comes to different people in different ways. Peace doesn’t always come in a form of perfect calmness and control. It doesn’t always instantly settle over us. Peace can be known in the craziness. Finding peace is when your exhausted, when your at your lowest of lows, you’ve hit rock bottom, and yet you know…And because you Know, you take a step of faith, and ask God to give you peace. Peace is knowing that God is in control even when your not. It’s knowing that He is with you and that you are not alone. It’s knowing that He has a plan for you. It’s knowing that He is all-powerful and faithful. It’s knowing that He is the ultimate giver of the peace you so desperately need. It’s knowing and believing in His peace. I challenge all of us to start searching for God's peace in our lives. Because, there is no qualification process when it comes to God's peace! Have you ever felt like true peace from God is hard to feel? Have you ever doubted that peace that surpasses all understanding even exists? How can we find this peace in our stressful situations and painful problems? Also, stay tuned for next week, because I have a fun bookish related post!! Thank you! I had fun making them! :D I'm so glad to hear that this post is what you needed today. It's been on my mind lately. Yes, me too. But I'm so glad that God gives us peace and helps us with our "petty problems" because they are not petty at all. He cares about where we are at, no matter how big or small of a situation. Your so right, God will never leave us to deal with these problems on our own. And it's amazing how He is right there offering the peace that we doubt even exists. All we have to do is ask and Know that He will keep His promises to us! I've been needing some peace lately. Great post! I pray that you are able to find that peace, Skye! God's got a plan for you. Wow, beautiful pist, Brooklyne! Loved it! Hope you are having a great January! this was so well put. The hardest part is the remembering the peace God can provide when your life is supper stressed, you are in a time of change and mild turnovers in your life, and feel like you are not enough. But the Peace He gives is rather ideal. Yes, it is so easily to get wrapped up in situations and forget to Be Still and Know that His perfect peace will carry us through. But it can, and it will... if only we ask. Peace is something we can only have through God, stay close to Him.